This Website has been developed by Corelle Brands to provide you with information about Corelle Brands' products and services. This Website may from time to time provide new information or data, but otherwise it is an archive of materials for your use. Like any printed material, the information and data on this Website may become out of date over time. Corelle Brands either owns the intellectual property rights in the underlying HTML, text, images, audio clips, video clips, software and other content (collectively, the "Content") that is made available to you on this Website, or has obtained the permission of the owner of the intellectual property in such Content to use the Content on this Website. Except as provided in these Terms, Corelle Brands prohibits the copying, redistribution, modification or public display of any Content on this Website without its express written permission. Corelle Brands hereby authorizes you to display on your computer, download and print pages of this website, subject to the following provisions: (i) the copyright and other proprietary notices appear on all such printouts; (ii) the information will not be altered in any manner; (iii) you do not use the Content in a manner that suggests an association with Corelle Brands or any of Corelle Brands' products, services or brands; (iv) you do not download quantities of materials to a database that can be used to avoid future downloads from this Website and (v) the Content is only to be used for personal educational and non-commercial use and will not be redistributed, broadcast or copied to any other media. Nothing contained herein shall be construed as conferring by implication, estoppel, or otherwise any license or right under any patent, trademark, copyright or other intellectual property right of Corelle Brands or any third party. The trademarks, logos, and service marks identified by ® , ™ or SM symbols, or that appear in type form different from that of the surrounding text, are listed on Exhibit A. These trademarks, logos and service marks are owned or licensed by Corelle Brands or one of its related entites. Corelle Brands claims neither ownership in, nor any affiliation with, any third-party trademarks appearing on this Website. Such third-party trademarks are used only to identify their respective owners, and no sponsorship or endorsement on the part of Corelle Brands should be inferred from the use of these marks. Pricing and availability of products on this Website are subject to change without notice. This Website may contain pricing information on certain Corelle Brands or other products. While Corelle Brands strives to provide accurate pricing and other product information, errors may occur from time to time. Corelle Brands reserves the right to correct any errors, inaccuracies or omissions, and to change or update information (including, without limitation, information related to pricing, availability and product descriptions), at any time without notice (including, without limitation, after a consumer may have submitted an order and received confirmation from us). 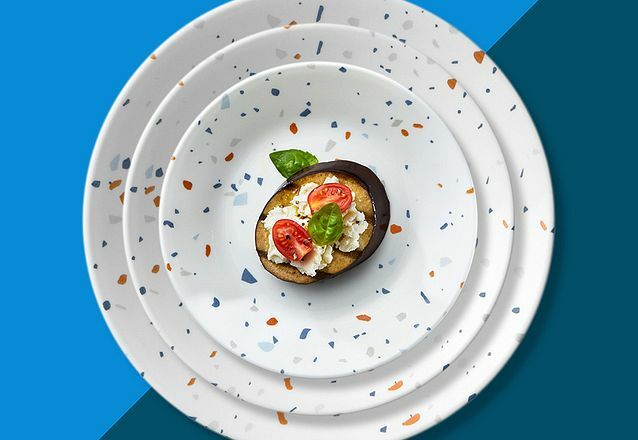 In the event that an item is listed at an incorrect price or with other incorrect information, Corelle Brands shall have the right, in its sole discretion, to refuse, cancel or revoke any order placed for that item, whether or not the order has been confirmed and your credit card charged. If your credit card has been charged for any order subsequently cancelled, Corelle Brands will issue a credit to your credit card. We apologize for any inconvenience this may cause you. The following is a partial list of the kinds of activities and content that are prohibited on or through this Website: (a) submitting content that is patently offensive to the online community, such as content that promotes racism, bigotry, hatred or physical harm of any kind against any group or individual; (b) engaging in activities or submitting content that could be harmful to minors; (c) engaging in activities or submitting content that harasses or advocates harassment of another person; (d) engaging in activities that involve the transmission of "junk mail" or unsolicited mass mailing or "spam"; (e) engaging in activities, or submitting content, or promoting information that is false or misleading or promotes illegal activities or conduct that is abusive, threatening, obscene, defamatory or libelous; (f) submitting content that contains restricted or password only access pages, or hidden pages or images; (g) submitting content that displays pornographic or sexually explicit material of any kind; (h) submitting content that provides instructional information about illegal activities such as making or buying illegal weapons, violating someone's privacy, or providing or creating computer viruses; (i) engaging in activities or submitting content that solicits passwords or personally identifiable information for commercial or unlawful purposes from other users; and (j) engaging in commercial activities and/or sales without our prior written consent such as contests, sweepstakes, barter, advertising and pyramid schemes. You agree that you will not: (a) use any robot, spider, other automatic device or manual process to monitor or copy web pages of this Website or for any other unauthorized purpose without our prior expressed written permission; (b) use any device, software or routine to interfere or attempt to interfere with the proper working of this Website; and (c) take any action that imposes an unreasonable or disproportionately large load on Corelle Brands' hardware and software infrastructure. Corelle Brands does not accept unsolicited materials or ideas for use or publication in its programming or in other digital, electronic or print Media. Corelle Brands shall not be responsible for the similarity of any of its content or programming in any media to materials or ideas transmitted to this Website. Corelle Brands may provide links to third party Websites, and some of the content appearing to be on a Corelle Brands website may, in fact, be supplied by third parties. Corelle Brands assumes no liability for any damages you may suffer from visiting such linked Websites (or, as noted in “Limitation of Liability” below, from visiting this Website), including without limitation, damages caused by computer viruses, Trojan horses or other destructive/disruptive code that may be downloaded from such linked Websites. Any links contained on this Website shall not be construed as an endorsement by Corelle Brands of any such linked website. Corelle Brands has not reviewed or researched the full content on these linked Websites and shall not be held responsible should you encounter any materials that may appear inaccurate, indecent or illegal. If you visit an inaccurate, indecent or illegal Website that is linked to this Website, please contact webmaster@corellebrands.com and we will determine if the link should be removed from this Website. You may not provide a link to this Website without our express written permission. If you would like to provide a link to this Website, please contact webmaster@corellebrands.com. Thanks for checking out the terms and conditions that cover Corelle Brands LLC use of your photographs and images. We’ll refer to these terms and conditions as “Terms.” The full Terms are laid out below. However, make sure you read the entire thing before agreeing to it. Terms: By submitting a photograph to us or by otherwise agreeing to our use of a photograph according to these Terms, you agree that you have read and fully understand these Terms and will comply with them in their entirety. Copyright: Don’t give us photographs that you didn’t take yourself or don’t have permission to give to us. You represent and warrant that you have taken the photograph yourself and own the copyright in the photograph, or have received the express permission of the copyright owner to have the photograph used and shared by us in accordance with these terms. Permission of any Person Pictured: Make sure that you have permission to take the photograph of any and all people appearing in the photograph and have their permission to have their image and name used by us. If any people pictured are minors, you must obtain their parent or guardian’s express permission to have their image and name used by us. You represent and warrant that you have express permission of everyone who appears in the photograph (and their parent or guardian, if applicable) to be photographed and have the photograph and their names used and shared by Corelle Brands LLC in accordance with these Terms. Before obtaining their permission and sharing the photo with us, send them a copy of or a link to these Terms. Corelle Brands LLC's Use of Photographs and Content: You keep all of your ownership rights to any photograph or other content but give us permission to use the photograph as determined by us. By submitting, or otherwise agreeing to our use of, a photograph or other content, including but not limited to photo captions, your name, and the names of any person appearing in the content (collectively, “Content”), you grant us the worldwide, unrestricted, royalty-free, irrevocable, sub-licensable right to (a) publish, publicly display and perform, modify, edit, alter and otherwise use the Content in whole or in part, without further consent, review or participation from you, for any purpose throughout the world (including commercial and promotional) in any medium or format now existing or hereafter created, including but not limited to print or recorded material, websites, and social media platforms; and (b) use your name, commentary, and other information about you in connection with the Content. We reserve the right to use, not use, or discontinue using any Content in our sole discretion at any time. You irrevocably waive all rights and agree to release and hold harmless Corelle Brands LLC from any and all claims, costs, expenses, damages, causes of action and/or liabilities, of any nature, whether direct or indirect, known or unknown, forseen or unforeseen, arising out of or relating to the Content, including but not limited to defamation; invasion of the rights of privacy or publicity; violation or any moral or artist rights; personal injury, damage to property, or any other similar matter. You further agree to indemnify, defend, and hold Corelle Brands LLC harmless from any claim or cause of action related to your violation of any these Terms & Conditions. Enforceability: If any provision of these Terms & Conditions are deemed invalid, illegal or otherwise unenforceable then that provision will be limited or eliminated to the minimum extent necessary, and the remaining provisions of these Terms will remain in full force and effect. When we refer to “Corelle Brands LLC” or “us” or “our” or “we” in these Terms & Conditions, we mean Corelle Brands, LLC and its affiliates, subsidiaries, successors, sub-licensees and assigns. This Website may contain forward-looking statements that reflect Corelle Brands' current expectation regarding future events and business development. The forward-looking statements involve risks and uncertainties. Actual developments or results could differ materially from those projected and depend on a number of factors including, but not limited to, the success of current programs, ongoing commercialization of products, regulatory approvals of products, validity and enforcement of patents, the stability of its commercial relationships, and the general economic conditions. The following are registered trademarks of Corelle Brands Holdings, Inc.